Whether you want to discover the wine region of Bergerac or the one of Duras, the Wine Centres are THE places to help you take your first steps in our vineyards! A must if you are in the area, the Wine Centre is right in the historic heart of Bergerac, in the Récollets Cloisters, a magnificent group of monastic buildings from the 17th century. At the Wine Centre you will find all the information you need to explore our vineyards and meet our vintners. A team of professionals is at your disposal to help you plan an unforgettable trip, with exactly what you want from the Bergerac vineyards. An exhibition: “Wine is a journey” which is a fabulous place to start your tour of the Bergerac vineyards. There is an historical fresco from the tertiary era to the present day, the film “Wine is a Journey” and a “senses room”. A wine library or vinothèque where you will find a selection of wines from the Wine Route. You can taste and buy wine and there are lots of wine accessories in our World of Wine store. A games and sensory discovery area is also available for our younger visitors. 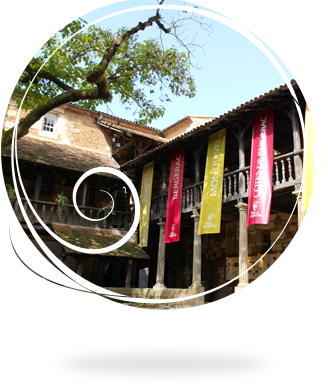 The Récollets Cloisters is one of the busiest places in Bergerac: concerts and exhibitions are regularly organised there. 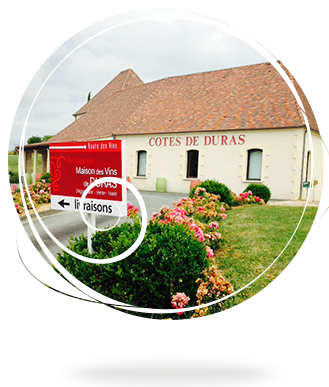 The Wine Centre of Duras, at the foot of the Castle of Duras, dominates the vineyard. Surrounded by a garden full of vines, one can find a small conservatory of grape varieties. Their team welcomes you all year long to make you discover all of the different wines that are made by the producers. They will also offer you to visit the vineyard through diverse itineraries! A ludic discovery of the world of wine! The Wine Centre has an innovative, permanent and free open course for all, entitled “les Clés du vignoble”. It is accessible and much appreciated by young and old alike! It is divided into two parts: first, an exhibition made by Cap Sciences Bordeaux, which sets out a playful and pedagogical approach to the world of grape-growing and winemaking through a visual and olfactory universe. Then, you will be able to experience our Discovery Trail in the vines garden, designed by Cap Sciences and constructed by the winegrowers of Duras. Everything is here to learn while having fun! Every summer, the local wine producers come to the Wine Centre and make you taste their wines!